Kristen Donnelly saw rosé's shades and thought: These would pair well with a pout. All this time, rosé has passed right by your lips, landing sweetly on your tongue. Now, you can wear your favorite varietal with these lightly tinted, all-natural balms by Kristin Donnelly. 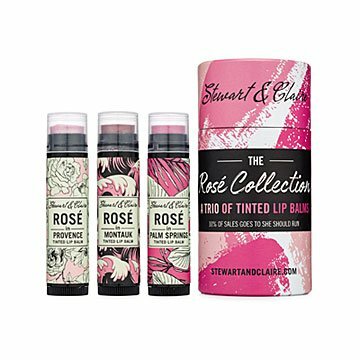 A foodie-turned-alchemist, Kristen saw the soft pink shades of rosé and thought: These would pair well with a pout. Send the trio to an amateur sommelier or a friend who embodies the airy sweetness of pink wine. Handmade in Iowa. My friend loves pink and Rose wine, so I grabbed this as a unique Christmas gift for her. I really think she's going to like it. It's definitely more expensive than I prefer, but the packaging is nice, and it's a unique gift that I'm proud to give her.